Me and My SoldierMan: Happy New Year! It's a New Year, y'all. Instead, we stayed in Saturday night and watched movies and ate some yummy homemade chicken enchilada roll-ups (thanks, pinterest!) and some store-bought queso. Still working on hiding the remote. And yes, we sit on the couch and watch movies while on our laptops. It's 2012, after all. I'm facing the new year with mixed emotions. Thanks to the Army and the world in general, SoldierMan and I won't be seeing a lot of each other the next 18ish months. I'm one year closer to turning 30, which I guess other people find exciting, but it's never been the carrot on the end of my stick. We should be able to actually go back to Disney this year. I could very likely have at least one book completed by the end of the year. Up, down, up, down. But rather than let myself go full-speed on that emotional roller coaster, I want to start 2012 fresh and forward-thinking. Dani at Hard Corps Love started this 11 in 2011 goal list last year, and I've decided to join her for 2012. Most of these are self-explanatory, many have specific numbers attached. And every month at the end of the month, I'll do an evaluation to keep myself on track. 1. MIND | Read at least one book a month, new or old, fiction or non-fiction. Memorize one Bible verse a week. 2. BODY | Work out 3x a week, minimum. Meal replacement shakes 1-2 times a day. 3. SOUL | Stick to a Bible reading plan. (<-- That's the one I'm doing. Click the link if you'd like to join me.) Find a church. Do a daily Bible study. Pick a verse for the year. 5. BLOG | Post 3-5 times a week. Host one giveaway a month. 6. LOVE | Follow "Power of a Praying Wife" every month for one year. Plan more creative date nights. 7. TIME MANAGEMENT | Plot out to-do lists for the week every Monday. "Stop feeling guilty when people you don't know ask you to do something you can't do." 9. CREATION | Get current on scrapbooking by the end of the year. Learn how to use new sewing machine for more than pot holders. Make something I want to wear. Plan and actually execute Christmas baskets this year. Take one picture every day, preferably with my camera. 10. KINDNESS | "Practice random acts of kindness and senseless acts of beauty." 11. KEEP IN TOUCH | Regularly update email, photos, Facebook, & twitter. If you want to join in the 12 Goals fun, click the link above to go to her blog and copy the banner for yourself! You should think about it! It would be so awesome for us all to get to December and be able to share our completed lists together!! Here's to a wildly successful 2012! I think our minds were on similar wavelengths with our goals lists! :) Can't wait to see your journey! I love the 2 laptops thing... we used to do that (when we had two that worked) and we'd even instant message each other on FB... it was sad, ha! 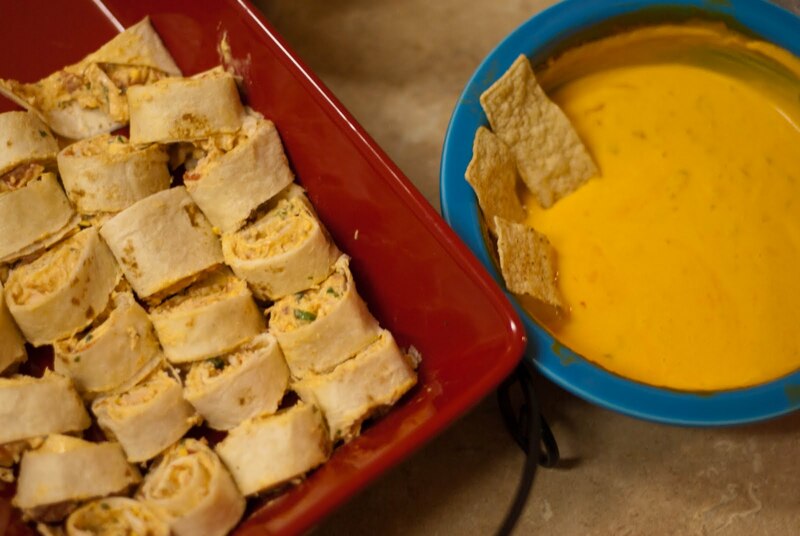 Those enchilada roll-ups look super delicious! Great goals for 2012! If I were to actually write goals down mine would be pretty similar. Especially the one about the sewing machine. I got my first sewing machine for Christmas this year. I have no clue how to use it. Right now it is just an expensive paper weight! Good luck on accomplishing all of your goals! Hope 2012 brings you great things! I got a tripod and remote too... And I LOVE that I can set it up and be in some non-staged family photos! This is awesome JG! I may join you!